Using eye shadow as a blush is easy, and makes your makeup options that much more flexible. Eye shadow offers a wider range of colors -- and more color payoff for dramatic makeup styles. Both have similar formulas, and you'll use similar techniques for applying them. Choose the type and shade of shadow that suits your skin, and you'll pull it off perfectly. The best eye shadows to use for blush fall in the color ranges of pinks to peaches, roses to browns. Pink and soft plum pair up with fair skin in cool tones. Peach shadow works with fair skin in warm tones. Berry and rose for medium and olive skin with cool tones are a match, and bronze and orange hues are lovely for medium and olive skin with warm undertones. Red shadows will be perfect for dark skin with cool tones. Raisin and orchid shades are complementary for dark skin with warm tones. 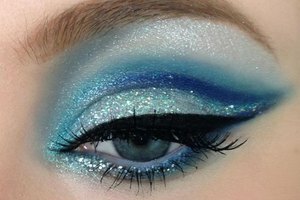 Whether you want a matte or shimmer shadow will depend: If you want party makeup, a shimmer shadow might be fine, although it won't appear very natural. If you want natural makeup, use a matte shadow. You can use either cream or powder eye shadow as blush: Cream is good if you want it to be long lasting, and for those with dry skin. Powder shadows are better for oily skin types, and can seem more natural than a cream eye shadow. Eye shadow is heavier than more opaque blush. Thus, your skin could break out if you wear eye shadow on your cheeks. 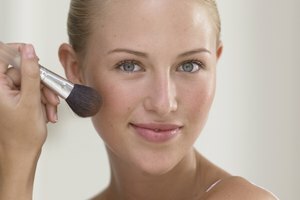 Thoroughly wash your skin after wearing eye shadow as blush -- or wearing any makeup, for that matter -- to avoid breakouts. 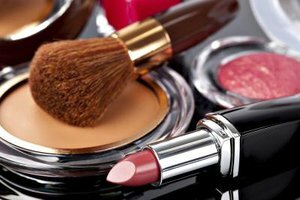 Since eye shadow pots or palettes are too small for a blush brush, use either a small plastic makeup applicator or a firm eye shadow brush to scrape the powder or cream out of the container and onto a clean tissue or makeup mirror. For powder eye shadow, tap a blush brush into the shadow. If there is too much powder on the brush, you can lightly tap it over a tissue to remove some of it. Sweep it where you want it on your face. You can also use a pink or rose to highlight the apples of your cheeks, and then apply a brown under it to contour the cheek. For cream eye shadow, either dip a makeup sponge into the product or use a cheek highlighter brush to stipple and blend it onto your cheeks. With stippling, you tap -- rather than sweep -- the shadow with your brush onto your cheeks. With cream products, you may need to blend more than with a powder to make it look natural. If you're using pink eye shadow as blush, a little often goes a long way. This is good because it will last longer, but not so good if you use too much. Test a few times to see how much works until you find the perfect amount.